Use case and a model Collab are reachable via the Brain Simulation Platform. In this work, we developed a semi-automatic process for constructing and validating whole brain models at the point-neuron level from biological data. The process has two phases: the first is a whole brain reconstruction and the second is a region-specific refinement. The first step of our workflow determines the position and type of each cell in the brain model, using high-resolution microscope image stacks from the Allen Mouse Brain Atlas. The differentiation into glia, excitatory neurons and inhibitory neurons is done using in situ hybridization (ISH) image data from the same atlas. We then use two-photon tomography images of rAAV labelled axonal projections Allen Mouse Connectivity Atlas, to obtain the mesoscale connectivity between neurons in different brain regions. In the second step, we integrate region-specific cell type ratios to refine their composition. The combination of the types, positions and spatial orientations of these neurons will help to reconstruct detailed microcircuits and predict intra-regional connectivity. Finally, we will simplify the detailed circuits using a single cell optimisation technique to obtain a point-neuron network, which can be simulated to study whole brain activity. 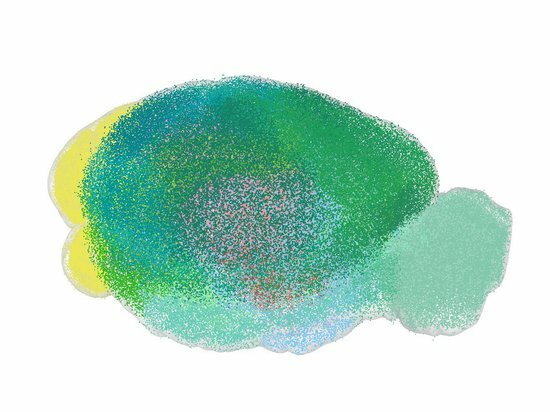 Our model provides so far cell densities, numbers, positions, orientations for every region of the Allen Mouse Brain Atlas; and types for specific regions. We also have reconstructed a mesoscale connectivity atlas from viral tracer injections. We are hence able to simulate the mouse brain as a point neuron network which will help us to further reproduce biological experiments. Future work will compare our simulation results against in vivo mouse brain activity. What makes a whole brain model special? A more common approach is to construct models “inside-out” region by region. This approach has a disadvantage that it depends on precise knowledge of how regions are delineated and how they are connected to each other. In fact, no two brain atlases agree on how a particular brain region is delineated in detail. By contrast, in our approach, we build the whole brain model from the “outside-in” using data that describes the brain or parts of it, independent of any regional assumptions. This has the advantage that our model is not biased towards a particular brain atlas. Moreover our model can in principal be registered to different brain atlases. In the context of the Human Brain Project, this work pioneers the digital reconstruction of whole-brain models by integrating a wide range of biological data. It represents a scaffold for the scientific community to use and integrate new data. The model also contributes to the detailed modelling efforts of HBP (SP6), by providing the global context into which detailed models of neural circuits or brain regions can be embedded. In the context HBP Neurorobotics research (SP10) the whole brain model is connected to a virtual mouse body that is embedded in a dynamic environment. In the context of HBP’s cross disciplinary research (CDP1) this embodied brain model is used to model in vivo experiments on motor rehabilitation after stroke. Ultimately, we aim at simulating behavioural experiments such as whisking and grasping. Future refinement of the whole-brain model therefore focuses on brain regions that are involved in sensory-motor processing. In our work the workflow represents the ability to build the whole brain model in a routine basis. It consists of a formalized cycle of modelling, validation and refinement. In each iteration of the cycle, a refined version of the model is produced, based on the information obtained during the validation results. Our workflow presents a significant improvement to current approaches, because it transforms the process of modelling from an ad hoc activity to a systematic operation. The first version of our brain model can already be simulated, but its connectome and the neuron properties have to be refined. To address this issue, we will implement the Allen Brain Atlas neuron models (GIFs) by September 2018. We also aim to extract spiking pattern from different E-type neurons in several brain regions to get a simplified version of each (by December 2018). Next, we want to use simplified models generated by detailed circuit reconstructions from other teams (by March 2019). Finally, we will create a validation pipeline which will test our model against experimental datasets, from the cellular to the whole brain level, in order to get an objective quantification of the error generated by our models by 2019. If you would like to use some of the results of this work (e.g. extract cell densities and types in specific regions of the brain), or get involved and contribute to our community effort, please contact any of us to discuss our common interests.